When you get your beads you can make it into a necklace or a bracelet, let your imagination take a flight! Here is an example of bracelets, wire wrapped with gold swarovski crystals. These Golden Paper Bead Bracelets is just right in time for the holidays. 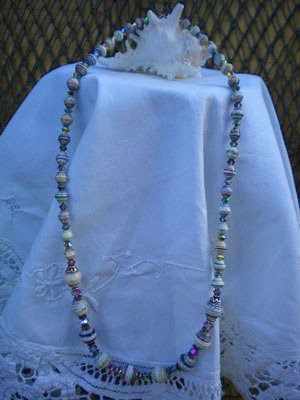 The finished paper bead jewelry would be multi colored and different shapes as it will show case the different beads from all the participants. 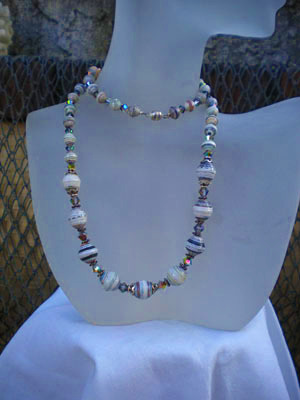 I always say this; paper beads jewelry can be elegant and I just treat paper beads as if it were real gems. 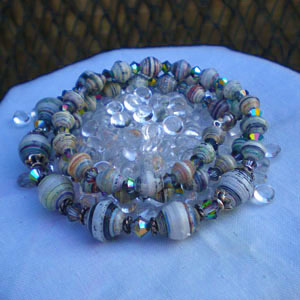 Here is an example of paper beads mixed with montana blue swarovski crystals. Silver bead caps were put in between to hold the paper beads on its side. 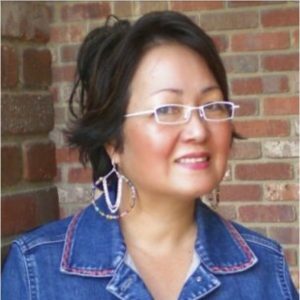 Paper beads can be fun, elegant, chic and definitely wearable! You still have until September 26th to join in the Paper Bead Trade – Fall Theme. Just left me a comment here or email me. 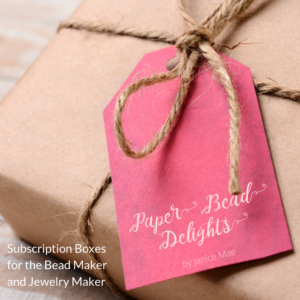 I’ve been reading your wonderful site for a while now — I’ve got a great stash of paper beads — Can’t wait to send them to you!! – Anne C.